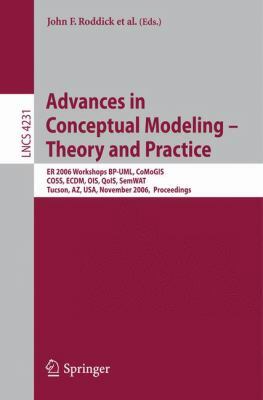 This book constitutes the refereed joint proceedings of seven internationl workshops held in conjunction with the 25th International Conference on Conceptual Modeling, ER 2006, in Tucson, AZ, USA in November 2006. The 39 revised full papers presented together with the outlines of 3 tutorials were carefully reviewed and selected from 95 submissions. Topics addressed by the workshops are best practices of UML (BP-UML 2006), conceptual modeling for geographic information systems (CoMoGIS 2006), conceptual modeling of service-oriented software systems (CoSS 2006), evolution and change in data management (ECDM 2006), ontologizing industrial standards (OIS 2006), quality of information systems (QoIS 2006), and semantic Web applications: theory and practice (SemWAT 2006).Roddick, John F. is the author of 'Advances in Conceptual Modeling - Theory and Practice Er 2006 Workshops Bp-uml, Comogis, Coss, Ecdm, Ois, Qois, Semwat, Tucson, Az, USA, November 6-9, 2006, Proceedings', published 2007 under ISBN 9783540477037 and ISBN 3540477039. Loading marketplace prices 88 copies from $120.74 How does the rental process work?